(CNN) - A confused crossword puzzle. A psychedelic postage stamp. A bar code on drugs. This is how a QR, or Quick Response, code may appear to most people. You may have noticed these black-and-white squares showing up in subway ads or in pages of magazines. Thanks to our growing addiction to our smartphones, you'll likely be seeing more of them. QR codes are showing up in more and more places: posters, storefront window displays, TV advertisements, business cards, websites and even on T-shirts. When accessed with your phone, a QR code takes you to a landing page where you'll usually find special promotional content. The QR code was invented by a Japanese company called DENSO Corp., a subsidy of Toyota, in 1994. The codes have been used in Japan for years and are quite common there. But only now are they becoming mainstream in the United States. First, you must download a QR scanning application for your smartphone. When you see a QR code on a poster or billboard, open the scanning app and use the phone's camera to focus the code on your screen. The application will recognize the code and automatically open up the link, video or image in your phone's browser. You just need an internet connection to access the content. Many QR scanning applications - RedLaser is a popular one - are available for Android, iPhone, BlackBerry and Symbian phones. Anyone can generate their own QR code for free, and you can link it to anything from URLs to contact information to your GPS location. Brands and companies are increasingly taking advantage of this relatively low-cost marketing tool. Last year, the animated movie "9" was promoted with green posters containing only a large QR code that took users to a new trailer and special features. A recent issue of Wired magazine included an ad by watchmaker Tag Heuer that contained a QR code that led users to images of its latest collection of timepieces. 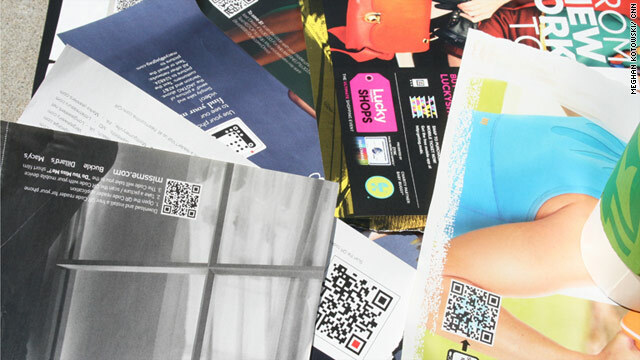 Magazine ads have used QR codes to promote everything from hair-care products to sheepskin boots to diamonds. 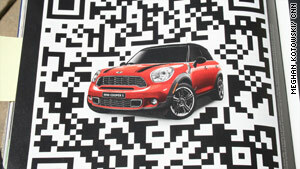 A QR code promotes Mini Cooper cars. Even New York City launched a QR code campaign in Times Square that linked to Notify NYC, the city's official source of emergency events and services. And people are responding. According to a February survey of U.S. smartphone users by MGH, a Baltimore social-media marketing company, 32% of respondents said they have scanned a QR code. Of those, 53% said they used the code to get a coupon or discount. And 72% said they were more likely to remember an advertisement with a QR code. Matthias Galica, CEO of ShareSquare, a QR code platform, said he believes that QR codes have changed the way people consume services and products. "Imagine you see a poster of your favorite artist's upcoming concert." Galica said. "Usually, you would have to go home to look them up. But QR codes work as paper-based hyperlinks that can lead you to music videos, the site for MP3 downloads, and even purchase tickets right there." But will that incentive prompt people to whip out their phones and scan the QR code? Galica seems to thinks so, and reminds us using our phone to get something in return is not a new concept. "The 'text to win' SMS campaigns have been very successful, and that's the trigger for QR codes." Galica said. "Something like getting a coupon through a QR code is a powerful call to action." Mobile coupon apps by companies such as Groupon and Living Social also may have helped familiarize consumers with the idea of using their smartphones to earn discounts. The kind of mobile content that the QR code leads to is as equally important as creating one. Rich Brooks, CEO of Flyte New Media, a Web design and internet marketing firm, said the rewards one gets through scanning QR codes should be valuable. Brooks said he once came across a company's Facebook page whose avatar was a QR code. When he scanned the code with his phone, it led him to the same Facebook page he had opened on his computer, leaving him disappointed. "I mean, what's the point of that?" he said. "You need to deliver something that is not available elsewhere and is something worthwhile, surprising." Brooks suggests QR codes should lead to discount coupons, a virtual tour of a real-estate property or a never-before-seen video, for example. ?You can the damage the brand of the company if you don't provide something of significant value." he said. "And I would not want to use your company." An ill-conceived QR code promotion can even backfire. Take the case of a recent promotional event surrounding the pre-release of hip-hop artist Lupe Fiasco's third full-length album, "Lasers". On a chilly night in February, Fiasco fans flocked to New York's Union Square after getting a mysterious tweet from him that said, "Union Square, NYC. Just look up in the sky. 7pm." Fans saw a laser show, projected high on the side of a nearby warehouse. The show ended with a customized RedLaser QR code that Fiasco's Twitter followers recognized immediately as his Twitter icon. The code took smartphone users to a landing page that let them pre-order the album. A spokeswoman for eBay, which owns RedLaser, told CNN in an e-mail that the event was "a huge success" and that approximately 25 percent of pre-orders for Fiasco's "Lasers" album were driven by the company's QR code. But according to several bloggers who were there, the event disappointed fans who expected the Chicago rapper to show up and put on a surprise concert. "The QR Code flashed and played previews for what looked like a music video - with no sound" wrote Myles Tanzer on a New York University blog. "People began to walk away very quickly, to say the least." Tanzer said some fans left the scene vowing to download the album online for free. Macy's "Backstage Pass" QR code led users to videos. On the other hand, experts say, Macy's iconic New York department store seems to have gotten QR codes right. Early in 2011, QR codes began appearing inside Macy's trademark stars in storefront windows and strategically inside the store. Even sales associates wore lanyards with the code for customers to use. When scanned, the code directs customers to Macy's special "Backstage Pass" landing page that offers behind-the-scenes videos of star designers such as Martha Stewart putting the finishing touches to a cake. Holly Thomas, vice president of media relations at Macy's, said that the store saw the opportunity to use QR codes to deliver unique content, especially when customers are not in front of a computer. "It's one application that can speak to customers across so many vehicles." she said. "QR codes are such a sensible way to send content with immediacy." And the campaign has met with some success. According to Thomas, during one week in February, there were an estimated 20,000 downloads through QR codes alone. Both Galica and Brooks said they believe the United States has reached a tipping point in terms of smartphone usage. In other words, most affluent professionals - the kind of person advertisers love - have smartphones now, making it necessary to include QR codes with all marketing material. However, Wayne Sutton, a digital marketing strategist, said that how marketers present a QR code will differ from company to company. He cited a recent Calvin Klein billboard in New York that contained a massive red QR code under the title "Get it uncensored" and nothing else. Calvin Klein could get away with it because the ad was edgy, just like the company, he said. "At this early age of QR codes, though, there should be additional information and images on the poster (to provide context)." Sutton said. That does not mean that companies cannot get creative with their QR code marketing. Sutton said that many QR codes can have patterns or logos embedded in them and around them, as long as the code itself works properly. To ShareSquare's Galica, there's something about a basic black and white QR code, and the promise of its hidden message, that makes it striking. "I'll admit, it's not a beautiful thing and stands out as a sore thumb," he said. "But it ends up being a signal that gets you something in return." Like internet ads, QR codes can help companies measure how many people are using the code and at what time. By having easily traceable analytics, marketing firms can view results and know if their QR code campaign is successful. "QR codes may not give the best immediate returns of investments, but they can tell a prospective buyer how cool and hip your company is." Brooks said. But more work needs to be done to raise awareness among American consumers about QR codes and how they work, experts said. While some consumers know how to use their phone cameras to scan, many do not. Galica said he believes scanning QR codes is not always intuitive and should not be taken for granted. He suggests that QR codes should be accompanied with text such as, "Scan with any barcode scanner on your phone." It is important, he said, to communicate the use of QR codes; otherwise, there is point in having them at all. "If you don't have the opportunity to interact with an advertisement you see, the meaning is lost." Galica said. Still, experts said QR codes are here to stay and will revolutionize the way companies market their products - as long as they reward consumers with content that is relevant to them. "QR codes can be a powerful tool of marketing if they are leveraged in a clever way," Sutton said.